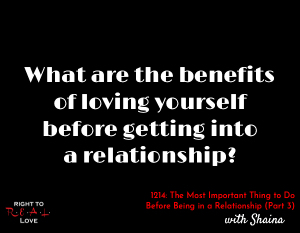 In this episode, Yahnathan concludes his discussion with Shaina of the Sisterly Love Podcast by addressing the question: What are the benefits of loving yourself before getting into a relationship? What are the benefits of loving yourself before getting into a relationship? Why Yah/God desires for us to love ourselves. How the Holy Spirit can help you develop self love. Acknowledge that effective prayer requires your heart to be right towards Yah. Invest time reflecting on your heart towards Yah and towards prayer. Ask someone to teach you how to pray and look into helpful resources that can teach you more about prayer too.